Note: If you are using a self-signed certificate, your clients would get an SSL warning while accessing the control panel on your server. To avoid this error and improve trust amongst your clients, we recommend you purchase an SSL certificate to protect the WHM control panel. Go to Home > Service Configuration > Manage Service SSL Certificates.This will display a list of certificates used by various services on your server along with their expiry dates. 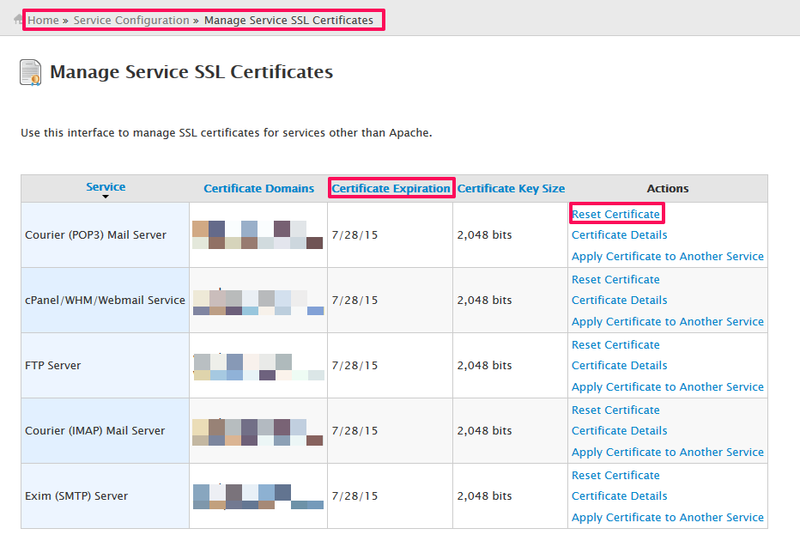 If any of the certificates are expiring within 30 days, click on the Reset Certificate link in the Action column. Once a new certificate is generated and installed, the Certificate Expirationcolumn will display the new expiry date.